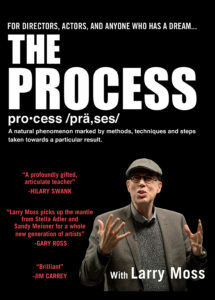 The Process, an Original Film That Pulls Back the Curtain of World-Renowned Acting & Directing Coach Larry Moss Available to the Public Beginning Wednesday, October 25, 2017 — "The Process"
HOLLYWOOD, CA– (Marketwired – October 09, 2017) – On Wednesday, October 25, 2017, The Process, an original documentary that pulls back the curtain of one of the most universally acclaimed acting coaches of all time Larry Moss, will be distributed on DVD and Blu-Ray, along with direct digital download at www.theprocessstudios.com, and select stores including Samuel French Bookstores and New York Drama Bookshop. It will be available for digital download on platforms including iTunes and Amazon in 2018. For the very first time on film The Process gives the audience a front row seat of world-renowned acting, directing coach, and author Moss, who has coached Academy® Award and Golden Globe Winners, including Leonardo DiCaprio, Hilary Swank, Chris Rock, Helen Hunt, Jim Carrey and rising star Hailee Steinfeld. The film, directed and produced by Mitzi Kapture, follows Moss as he works alongside a young director and his actors taking them from their first choices to a final polished performance; allowing the viewer to absorb what makes The Process so effective and brilliant. It also features appearances by Academy® Award Winner, James L. Brooks and is moderated by USC Cinematic Arts Professor, Barnet Kellman. The film includes a hilarious clip featuring Tracey Ullman and Mel Brooks from The Tracey Ullman Show. The DVD and Blu-Ray includes special bonus interviews and includes tips from these seasoned pros. This never before seen documentary offers viewers a peek of a rehearsal process that will elicit a richer comedic performance by exploring the subtext of gifted comedic writers. Hollywood is taking note of The Process and is praising Kapture’s documentary. “A profoundly gifted, articulate teacher,” said Academy® Award winning actress Hillary Swank. “Larry Moss picks up the mark from Stella Adler and Sandy Meisner and for a whole new generation of artists,” said writer and director Gary Ross (The Hunger Games, Sea Biscuit, Pleasantville). Larry Moss has coached Academy Award and Golden Globe Winners, Leonardo DiCaprio for Aviator, Blood Diamond, Wolf on Wall Street, and the Departed, Hilary Swank in, Boys Don’t Cry and Million Dollar Baby, and Helen Hunt in, As Good As It Gets. Moss also coached, Hailee Steinfeld for her role in Edge of Seventeen, Michael Clarke Duncan in The Green Mile (Academy Award nomination), Chris Rock on his feature, Top Five, Hank Azaria in Tuesdays With Morrie (Emmy Award), Jim Carrey in The Majestic, Tobey Maguire in Seabiscuit, plus Tony Winners and Broadway stars Sutton Foster, Nathan Lane and Donna Murphy as well as many others. Moss is the author of the book on acting, The Intent to Live. Moss is one of the most sought out acting coaches of our time and he has been teaching for over 35 years. Producer and Director Mitzi Kapture is best known for lead roles in television and films. American actress, producer, and director, Kapture garnered global recognition for portraying Sgt. Lance in Silk Stalkings and was inspired by the prolific series creator Stephen J. Cannell, who supported her interest behind the camera as a director and storyteller. Having starred and directed several episodes of Silk Stalkings, Kapture continued to explore both sides of the camera. It was from this culmination of her acting and directing experiences that Kapture conceptualized The Process. The Process is directed and produced by Mitzi Kapture. It is executive produced by Ralph Hemecker (Blue Bloods, The Flash, Once Upon a Time) and presented by Mythic Films, MayRae Productions, and The Process Studios. For more information please visit https://theprocessstudios.com/trailer/.